If you are booking a holiday with Tortoises on Holiday, you will then have the option of using the collection and return service. 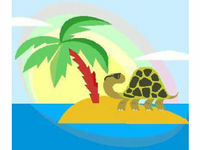 This is a hassle and stress-free service where Tortoises on Holiday will pick up and return your tortoise(s) for you. All tortoises will be transported in a secure box with adequate ventilation and warmth as necessary. Normally Tortoises on Holiday will only collect within 150 miles radius from Gillingham, Dorset but can meet halfway. Delivery costs are calculated based upon mileage at 50 pence per mile. This charge is for both ways from Tortoises on Holiday base to the location and back. Return is from Tortoises on Holiday base to the location and back. Our address is on the Contact Us page.